On March 23, Bolivia celebrates Day of the Sea (Dia del Mar). Why does a landlocked country has a commemoration dedicated to the sea? Bolivia used to have outlet to the Pacific Ocean, but lost it during the War of the Pacific in the late 19th century. The War of the Pacific was fought between Chile and allied Peru and Bolivia from 1879 to 1884 (the final peace treaty was signed in 1904). It resulted in Chilean victory. Bolivia lost its outlet to the sea, becoming a landlocked country. Bolivian Day of the Sea commemorates the first battle of the war, known as the Battle of Topáter, which occurred on March 23, 1879. The Bolivian troops tried to defend the town of Calama, but were defeated by the Chileans. The national hero of Bolivia, Colonel Eduardo Abaroa, was killed in this battle. 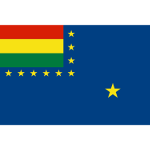 Although Bolivia has been landlocked for a long time, it still maintains its Naval Force. The country has not reconciled with the lost of its Pacific coast and the existence of the Navy symbolized the hope of regaining its coastal territory. Day of the Sea is marked by solemn ceremonies throughout Bolivia. On the occasion, flowers are laid at the statue of Eduardo Abaroa. The Bolivian Naval Force participates in parades on this day.